A delegation of farmers from Eastern province has complained of mental torture and neglect by the PF government due to non payment of their maize produce for last year’s season. The farmers delegation that travelled to meet UPND leader Hakainde Hichilema said they were in a state of confusion on the way forward for their farming business and families because they have not been paid their monies for the maize they supplied to Food Reserve Agency (FRA) last year. The farmers that came from various constituencies in Eastern province said their plight was compounded by the fact that their area has so far not received sufficient farming inputs for this season. They complained that the few that have received inputs were only getting one or two bags each as opposed to four they used to get in the past. The farmers said in some cases, two people were made to share one pocket of fertiliser and even then, some are receiving top dressing fertiliser instead of basal dressing which was more relevant now. The farmers said they have made numerous representations to various PF government officials and are now fed-up with the fake promises so far. And Mr. Hichilema has said he has received similar disturbing reports from various parts of the country of farmers not being paid there monies and people sharing pockets of fertiliser. He said he has been on the ground to check on what is obtaining and found that people, especially farmers are highly depressed especially now that they have to send their children to schools. He said what is even worse is that the PF government abruptly discontinued affordable basic school system meaning that most children have to be sent to boarding schools which require more expenses, yet parents have no incomes. He described the PF leadership as behaving like a group of kids daily fighting for a toy to play with instead of governing the country. “These people will never be ready for the many challenges facing this beautiful country but just interested in their own bellies, hence the kid-like fighting among themselves everyday. This is just a group of individuals that belong to a boxing ring fighting for a borne,” he said. He said as UPND, he was not surprised with their behaviour because he associated with them and saw how they take people’s lives for granted through continuous lies. 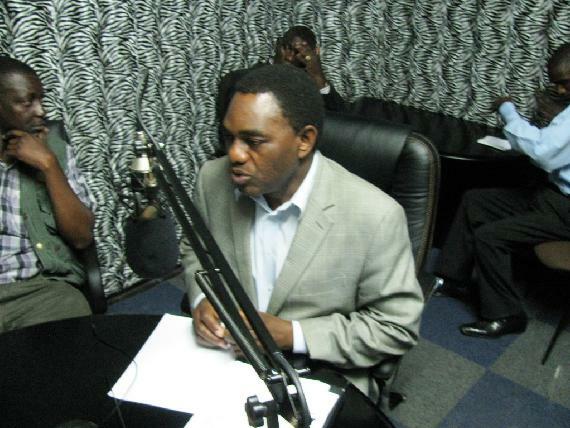 Mr. Hichilema said he feels sorry that all areas of political and economic development are being suffocated because of a few selfish people bent on destroying the good image the country has attained over years. He said that all well- meaning Zambians have voiced concerns on the current wastage of resources that are being spent on PF induced bye-elections. “If only we can spend a fraction of that money being spent on traitors being bought by PF on you farmers and your children, I would equally feel proud and applaud that indeed we have a government in place. The best way to shame some of us they keep calling bitter is to make you people and your children happy then I will have nothing to say,” he said. He said he has also received numerous representations from people that have been retired or unfairly dismissed that are not being paid their dues. He gave an example of diplomats that have been recalled and replaced with unqualified PF cadres as among the people that are currently stranded because they have not been paid their money yet the ‘kids’ in government are busy creating bye-elections. He said with the lack of attention to farming, the nation is headed for hanger and possibly yellow maize as some people in government would rather make deals in maize importation than looking after their own farmers.